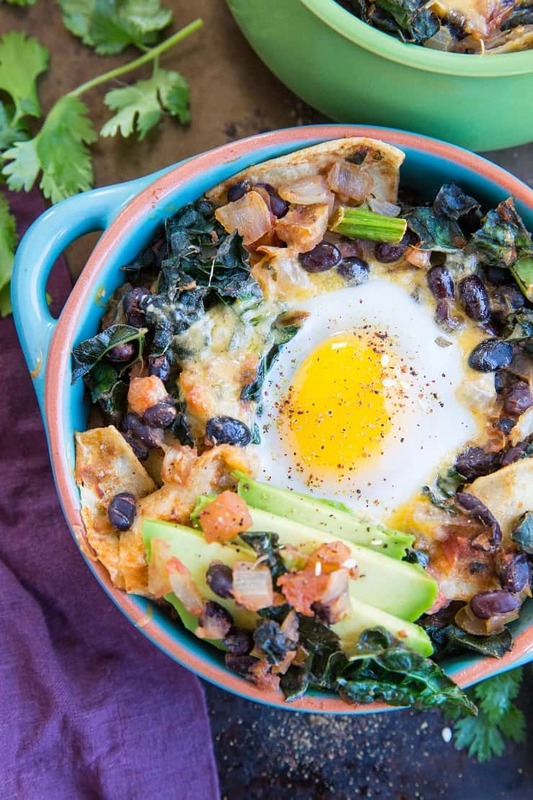 Your classic huevos rancheros assembled in a bowl and baked in the oven for a nourishing, filling breakfast! If you’re a lover of Mexican food and can be found consuming it any time of the day, I have quite the breakfast for you! Traditional huevos rancheros consists of beans, salsa, cheese, and a sunny side up egg served on top of a crispy corn tortilla. 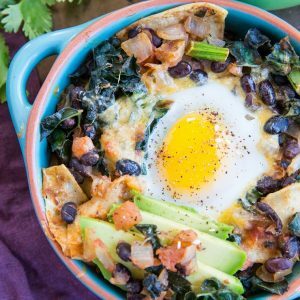 For this unique spin on the recipe, we take all of these essential elements and bake them in an oven-safe bowl in the oven, and we include kale…because: vitamins. The end result is that incredibly flavorful, comforting personal-sized experience. 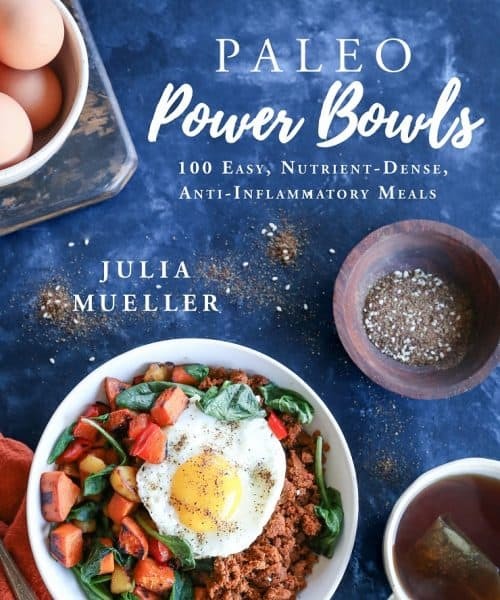 Based on the fact I recently finished Paleo Power Bowls (a cookbook that focuses on bowl food), you can probably guess I’m obsessed with the concept of eating all the foods out of bowls.There’s just something so cozy and intimate about it! 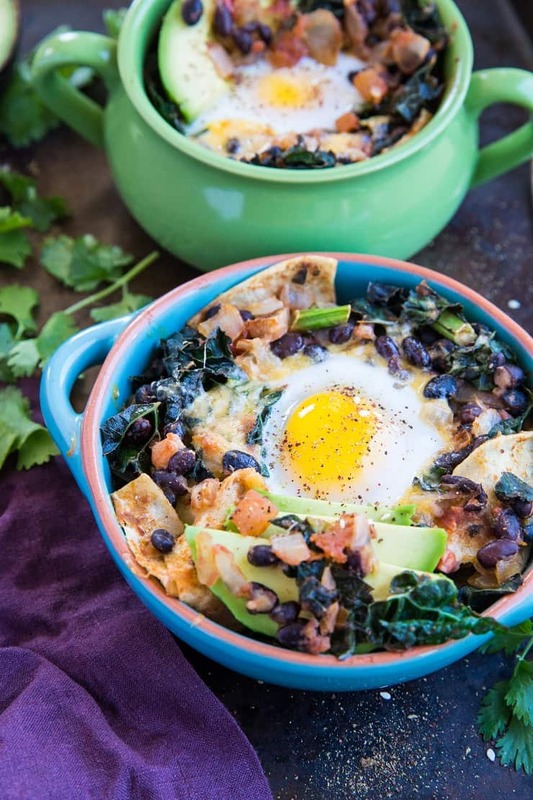 So taking the classic huevos and turning it into a bowl is one of those things that just feels so natural. The major benefit to preparing huevos rancheros in this way is you can make many servings at the same time. Rather than having to make your sunny side up eggs one at a time, you simply put all of the ingredients (egg included) in the oven at the same time so that the egg cooks to perfection in the oven. 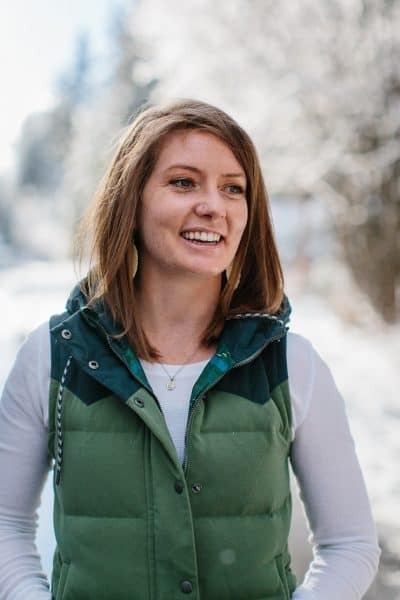 This eliminates both the challenge of cooking the eggs (I don’t know about you, but making the perfect sunny side up egg can be a task…especially when I’m under-caffeinated) and the back and forth of trying to serve everyone at the same time. This recipe serves four people, but you can easily double it to serve more people. You can also get creative with your add ins – change up your choice of beans, salsa, cheese, etc. Oh, and adding chorizo is always encouraged! You can also serve the huevos rancheros with any of your favorite toppings, including more cheese, a different type of salsa (or sauce) from what you put in the bowls, and/or guacamole. Low-FODMAP friends: this isn’t a super easy recipe to make low-FODMAP, but it is certainly possible! You will need to omit the onion and garlic (you can certainly replace them with your favorite in-season vegetables – zucchini and carrot would be marvelous!!) and use a Low-FODMAP salsa. You can now find Low-FODMAP salsa at most natural food stores, and it can also easily be made at home. Heat the oil in a large skillet over medium heat and add chopped onion. Saute, stirring consistently, until onion is transluscent, about 8 minutes. Add garlic and cook another 3 minutes, stirring frequently. 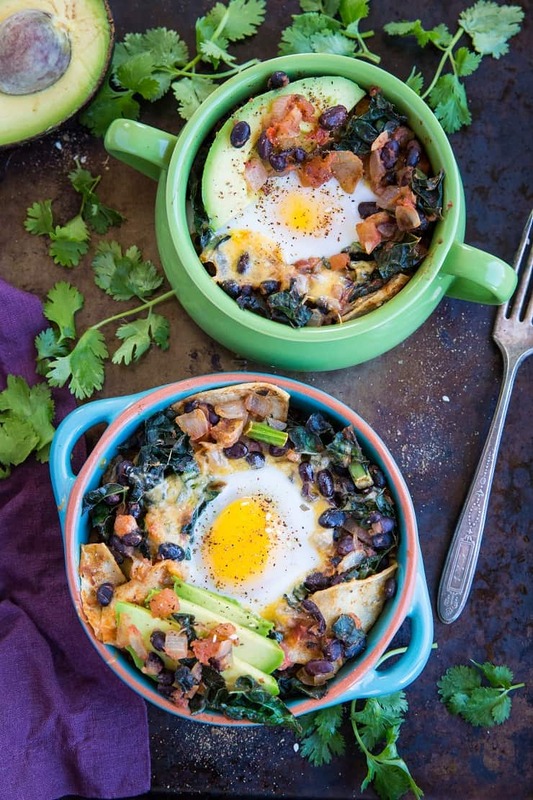 Add kale, black beans, chopped tortillas, and salsa. Continue cooking and stirring until kale has softened, about 5 minutes (It's okay if the tortillas break apart during this process! No big deal). Divide this mixture between 4 oven-safe bowls or 4 ramekins and sprinkle with cheese. Make a small well in the center of each bowl and carefully crack an egg into each well. Place bowls on a large baking sheet and bake for 20 to 25 minutes, or until the egg whites have set up. Serve bowls with sliced avocado. *Use your favorite homemade or store-bought salsa. I like using pico de gallo. Really….there’s a low-FODMAP salsa? I normally just eat the onions and garlic and because it’s almost impossible to live (or cook) without them! This dish is something I would absolutely love! Looks great! I’ve always wanted to try huevos rancheros but I’m allergic to beans and absolutely hate cilantro so restaurant ones are a big no-no for me. However, I could certainly try to modify the recipe to avoid these two ingredients and still have the taste (I’m a savory/spicy kinda person). Looks amazing and will definitely be trying! Where did you get your oven safe bowls? I love them!